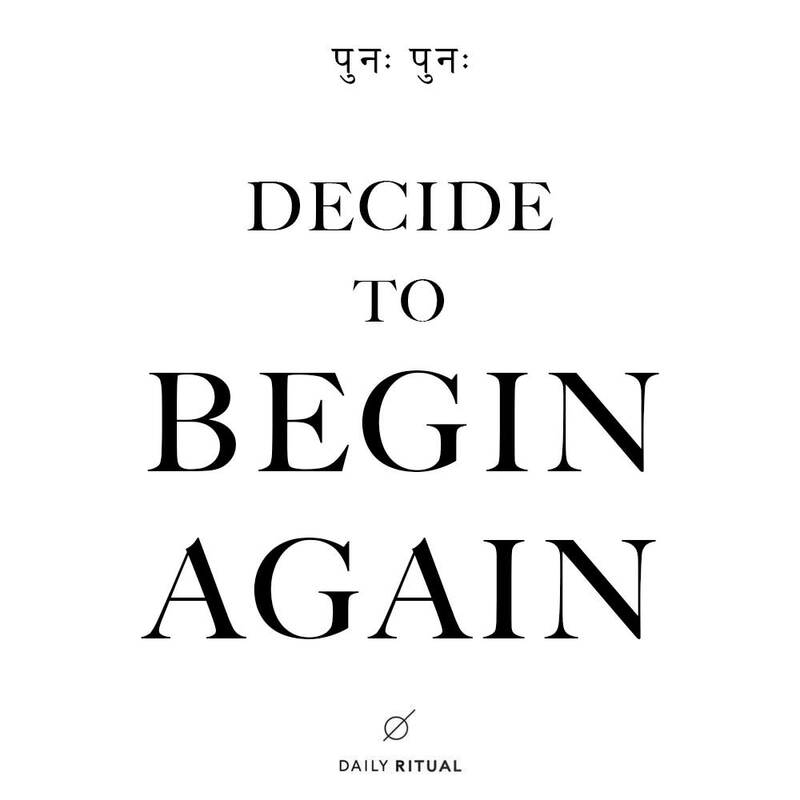 MEANING: "I choose to begin again"
This mantra is a simple way to sent an intention to begin again or give yourself permission to start from scratch. All things eventually come full circle and we may find our selves right back to the beginning of it all. This mantra is a reminder of the cyclical nature of all things; we all move through cycles of existence from birth, to sustenance, to destruction and possibly back again to re-birth. When I was a Sanskrit student in India, we learned chants and verses the "classical way" through recitation and repetition. Staying the silent student in the back corner is not an option in a Sanskrit classroom. Everyone must recite and answer aloud. For me, this was always a vulnerable experience. As an introvert, it isn't always easy to share my voice aloud. To make things even more uncomfortable, we almost always had to repeat an answer many times before our guru (headmaster) was satisfied. Attitude, tone, rhythm, pronunciation, and volume were all taken into account. Whenever our beloved teacher was not fully pleased with our manner of articulation or recitation, she would command, "punaḥ punaḥ!" meaning "Again, again!" We would have to start over from the top. I would think, "Oh no! not again!" and us students would either laugh or cringe depending on how many times we had already gone through the particular exercise. If we were under-prepared, it was painfully obvious! However I felt about having to repeat full verses over and over again in front of the entire class at any moment, it was always a humbling experience... a reminder that ease only comes through constant practice. As so many of the great yogis and sages tell us, it is only through the commitment to showing up again-and-again in a positive manner and with the enthusiastic attitude of a beginning student do we really come to know mastery. When I had started my journey into the world of Sanskrit, I was insecure and embarrassed at my attempts at pronunciation and the very sound of my voice as I struggled with a language outside of my native tongue. With practice and repetition (punaḥ punaḥ!) I learned to relax and enjoy it. Now, whenever I hear the command "punaḥ punaḥ" I am grateful! Those few syllables that used to provoke anxiety in me are now a reminder to relax. I am reminded that I have a second chance to experience the verse again... another occasion to pronounce a word with more sweetness, and the perfect opportunity to humble myself to the practice and my teachers.